News / Events - Camden County Council On Economic Opportunity, Inc. Qualifications: Must have excellent writing and organizational skills, and the ability to coordinate the activities of the office to assure timely completion of tasks. The applicant must attend all meetings of the agency's Board of Directors and take/transcribe the minutes. In addition, the person hired must coordinate activities of the office and serve as an office manager. Resumes may be faxed to 856-962-6922 or emailed to MHenryParker@cccoeo.com no later than 1/22/2019. CAMDEN COUNTY, NJ ─ Camden County Council On Economic Opportunity, Inc., a private, non-profit agency dedicated to serving and uplifting low-income individuals and families in Camden County, has received a $530,000 grant from the Federal Government to help reduce the homeless population in Camden County as well as assisting those in danger of becoming homeless. The Homelessness Prevention and Rapid Re-Housing Program, commonly referred to as HPRP2, Byrd says, targets two vulnerable populations at-risk of homelessness. First and foremost are individuals and families living on the streets or in emergency shelters (up to 90 days). HPRP2 helps in obtaining permanent housing. The second groups targeted are households facing imminent eviction from their place of residence. Financial Assistance is provided to prevent eviction. The second Camden County OEO office to receive help from the HPRP2 Program is the Urban Women’s Center at 900 S. Broadway, Camden City. Their telephone number is (856) 365-8989. Office hours are Monday through Friday, from 9 a.m. to 5 p.m. HPRP2, as the program is commonly known, is funded by the United States Department of Housing and Urban Development (HUD). The New Jersey Department of Community Affairs is responsible for overseeing the program’s requirements in the state’s eligible counties. Besides Camden County, the other counties are Atlantic, Bergen, Burlington, Cape May, Essex, Gloucester, Hunterdon, Monmouth, Morris, Ocean, Passaic, Salem, Somerset, and Sussex. Since 1966, Camden County OEO has provided comprehensive financial, educational and housing services to over a half-million clients and produced more than $500 million in services to the local economy. Based in Camden City and with offices in other townships and boroughs in Camden County, Camden County OEO says that HPRP2 has as its primary focus housing. Financial assistance is provided to help pay for housing and case management and services are offered to maintain housing for income-eligible clients. Besides providing programs and services to help clients achieve self-sufficiency, Camden County OEO offers material assistance to low-income persons in emergency circumstances. The agency’s comprehensive programs and services include: Community Action Services; Weatherization (Low Income Home Energy Assistance Program) LIHEAP & ENERGY; New Jersey (Statewide Heating Assistance and Referral for Energy Services) SHARES; (Payment Assistance for Gas and Electric bills) PAGE Program; Housing Construction and Rehabilitation; Emergency Services; Youth Employment and Training; Youth Activities; Homeless Prevention; Services to Homeless; Supportive Housing; Grandparents’ Support Group; Urban Women’s Center; Literacy Training; High School Diploma Training; Adult Basic Education; and Dollar-To-Dollar Individual Development Account (IDA) Program. Moreover, the agency provides space at its main office on Broadway in Camden City for other social organizations and youth and community groups, including Narcotics Anonymous. Camden County OEO’s Urban Women’s Center houses single women, single men and their families. Located at the Center also is Liberty Place that provides help to homeless women and children who are eligible for affordable apartments. The Outreach Men At Risk (OMAR) Program is located at 723 Kaighn Avenue, in Camden. This permanent housing program is home to 10 single men. For 15 year, the agency’s Urban Women’s Center has utilized federal grants to help underwrite the financial costs for housing single women with children, and single men. In addition, the Center has grown its literacy and youth programs to assist over 170 persons with education. Clients have been helped in achieving their high school diplomas, increase their Test of Adult Basic Education (TABE) scores, and find employment. TABE is a placement exam used nationwide to assess students’ skills in English, math and reading. For additional information about Camden County OEO and HPRP2, contact the agency’s Housing and Community Initiates Director Barbara Wanzer at 856-964-6887, or bwanzer@cccoeo.com; and Case Manager Danielle Majied, also at 856-964-6887. Click here to view the press release issued to the local media. (Spanish Version) Also, click here for KYW News Radio article: Camden County OEO receives grant funding to prevent homelessness. Qualifications: Must be fluently bi-lingual (Spanish/English) with the ability to speak, read and write Spanish. Must have a minimum of an Associate's degree or 2 years of college education. Experience working with low-income and disadvantaged populations. A background in Human Services with a concentration on housing services is preferable. Resumes may be faxed to 856-365-2784 or emailed to dmajied@cccoeo.com no later than 1/4/2019. Camden, NJ – Camden County Council On Economic Opportunity, Inc. (Camden County OEO) recently received a $5,000 grant from Investors Foundation. This grant will help further Camden County OEO’s mission of providing services and resources to low-income individuals in order to achieve self-sufficiency. “Camden County OEO is pleased that Investors Foundation is providing this grant to support our Individual Development Account (IDA) Program. With this grant, Investors Foundation will enable a family with low-income to achieve the dream of homeownership and begin to create wealth,” said Arnold N. Byrd, Executive Director of Camden County OEO. The IDA Program targets local individuals and families who live at or below 200% of the federal poverty guidelines to provide financial literacy classes, case management, business/technical planning assistance, and a 200% match of savings accumulated by each participant. Their total savings will in turn be used for assets such as acquiring a home, attending post-secondary classes, or even starting a business. Camden County OEO’s dual purpose is arranging for and providing material assistance that gives immediate relief to low-income persons in emergency circumstances. In addition, the agency provides programs and services to help clients achieve self-sufficiency. Camden County OEO has helped several thousands of men, women, and families throughout the years. For income eligibility guidelines, go to www.camdencountyoeo.com or to enroll, contact Camden County OEO at 856-962-6911 x27. Camden County, NJ ─ Camden County Council On Economic Opportunity, Inc. (Camden County OEO) hosted a Clean Comedy Contest on April 15, 2016 to raise funds to start a scholarship fund. The scholarship fund has a total of $5,000, which will be awarded to two (2) Camden County residents with low incomes to assist with the costs of college or trade school. Camden County OEO is proud to announce that the agency is accepting applications for the Step Up Scholarship Fund. Eligible applicants must be a resident of Camden County. One award will be allocated for a Camden City resident due to the high rate of poverty in one of the poorest cities of America. Applicants must have the following: a C+ or better grade point average, a completed 1-page scholarship application, an acceptance letter from a college or trade school, a combined parents’ annual income of less than $60,000, a brief essay explaining why the applicant should receive the scholarship, and a high school diploma or equivalent. “The Step Up Scholarship is a product of the Clean Comedy Contest we held earlier this year. Camden County OEO is proud to use this scholarship fund to help students with their post-secondary education costs. This scholarship directly supports the agency’s mission by uplifting Camden County residents with low incomes so they can become self-sufficient,” said Arnold N. Byrd, Executive Director of Camden County OEO. Camden County OEO, a private, non-profit agency dedicated to helping economically disadvantaged individuals and families in Camden County to achieve self-sufficiency through a range of programs and services, is celebrating its 50th anniversary in 2016. For the Step Up Scholarship Fund application and more information, visit www.camdencountyoeo.com. Click here for the article in the Anointed News Journal. Founded in 1966, the private, non-profit agency is celebrating its 50th anniversary. CAMDEN COUNTY, NJ ─ Camden County Council On Economic Opportunity, Inc., a private, non-profit agency celebrating its 50th anniversary, is hosting “Community Day” ― an event featuring a day of fun-filled activities for persons of all ages, live entertainment, a classic car showcase, and a variety of food vendors ― in Cooper River Park (Stadium), on Saturday, August 27, 2016, from 11 a.m. to 4 p.m. Entry to the event is free and open to the general public. Other activities include a performance by the Universal Dance & Drum Ensemble, singers, a DJ, dancing, an inflatable obstacle course, face painting, and facial makeup makeovers. Limited transportation is available to the stadium. “Camden County OEO is hosting Community Day in Cooper River Park as an opportunity for people to spend time together with their families, friends and community and enjoy a day of fun and to learn more about Camden County OEO’s programs and services,” says Arnold N. Byrd, Camden County OEO’s Executive Director. Since its founding in 1966, Camden County OEO has provided comprehensive financial, educational and housing services to over a half-million clients and produced more than $500 million in services to the local economy. The agency’s 50th anniversary theme is also its slogan ― “Creating Opportunities and Making a Difference” ― for providing a range of programs and services to helping clients achieve self-sufficiency. Based in Camden City and with offices in other townships and boroughs in Camden County, Camden County OEO is observing its 50th anniversary with a variety of events. Besides sponsoring Community Day, the agency’s Urban Women’s Center is coordinating a winter coat drive in December. In addition to providing programs and services to help clients achieve self-sufficiency, Camden County OEO offers material assistance to low-income persons in emergency circumstances. The agency’s comprehensive programs and services include: Community Action Services; Weatherization (Low Income Home Energy Assistance Program) LIHEAP & ENERGY; New Jersey (Statewide Heating Assistance and Referral for Energy Services) SHARES; (Payment Assistance for Gas and Electric bills) PAGE Program; Housing Construction and Rehabilitation; Emergency Services; Youth Employment and Training; Youth Activities; Homeless Prevention; Services to Homeless; Supportive Housing; Grandparents’ Support Group; Urban Women’s Center; Literacy Training; GED Training; Adult Basic Education; and Dollar-To-Dollar Individual Development Account (IDA) Program. For additional information about Camden County OEO and the organization’s 50th anniversary celebration, contact Sam W. Pressley (sampress@sampress.com; phone 609-634-6369 or 856-582-3836), or Barry Smith (bsmith@cccoeo.com) at 856-964-6887. ​July 2016: Camden County Council On Economic Opportunity, Inc., a private, non-profit agency dedicated to serving and uplifting economically disadvantaged individuals and families in Camden County, is celebrating its 50th anniversary. Since 1966, Camden County OEO has provided comprehensive financial, educational and housing services to over a half-million clients and produced more than $500 million in services to the local economy. The agency’s 50th anniversary theme is also its slogan ― “Creating Opportunities and Making a Difference” ― for providing a range of programs and services to helping clients achieve self-sufficiency. Based in Camden City and with offices in other townships and boroughs in Camden County, Camden County OEO is observing its 50th anniversary with a variety of events. Planned anniversary activities include Camden County OEO Community Day, a Walkathon and a Health Fair in Cooper River Park on August 27, 2016. The agency’s Urban Women’s Center is coordinating a winter coat drive in December. Earlier, Camden County OEO presented a “Clean Comedy Contest” in April at the Collingswood Theater and Ballroom for aspiring local comedians. The celebration will culminate in a program and dinner at a special meeting of the Camden County OEO Board of Directors on Tuesday, September 27, 2016, at 5:30 p.m., at Nicolosi Catering, 1 Hessian Avenue, in West Deptford, N.J.
To mark the occasion, Camden County OEO is also producing a commemorative booklet: Camden County OEO Retrospective: 1966-2016. The four-color booklet, complete with photographs, will feature the history of the organization and highlight its 50 years of service, achievements and milestones. Byrd, the recipient of numerous awards for his accomplished leadership role at Camden County OEO, has served as executive director of the award-winning organization since 1984. In addition, the agency has renovated several childcare centers throughout Camden County, opened the Urban Women’s Center, and created several other housing facilities and educational and job training centers. The facilities are noted for having made a positive and tremendous impact on the Broadway-Kaighn Avenue corridor, a main residential and business area in Camden City. 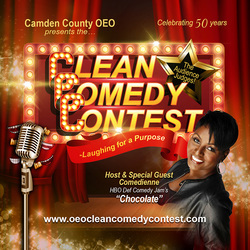 ​Camden County OEO has organized its 1st Clean Comedy Contest. The fundraiser will be held April 15, 2016 at the Scottish Rite Theatre in Collingswood, New Jersey. Special guest comedienne "Chocolate" will host our night of laughter. This event will give up and coming comedians the opportunity to showcase their talents to their local communities while simultaneously raising money to start a scholarship for Camden County residents to attend college or a trade school. Buy your tickets now so you can laugh in the best seats in the house! Camden County OEO welcomes you to join us for a night of laughter! Visit the Clean Comedy Contest Website for more information and where to Buy Tickets! February 2016: Camden County OEO received additional funding to continue the Youth Achievement Program for youths ages 16 to 21 who have dropped out of school. The program offers classroom training and work experience. Click here to view an article in the Courier Post. Call 856-365-8989 for info to join the program. ﻿January 2016: Camden County Council On Economic Opportunity, Inc. (Camden County OEO) has been awarded $130,725 from the New Jersey Department of Community Affairs to administer the Homeless Prevention Program. The Homeless Prevention Program (HPP) began this past August and ends on July 31, 2016. Eligible Camden County residents must have a summons or warrant of removal from a landlord-tenant court that is no more than 6 months old, gross income at or below 80% of the area median income, have resided at the housing unit for at least three months without incurring arrears, and currently has the ability to pay monthly housing costs after receiving HPP assistance. Camden County OEO is continuing to accept applications for the HPP program. Click here for a press release and article in the Anointed News Journal regarding HPP. Contact our office at 856-964-6887. February 2015: The City of Camden has awarded Cam﻿den County OEO an additional $94,000 to help prevent homelessness and the disconnection of utilities for Camden residents with low incomes. The funding must be spent by April 30, 2015. Click here for the press release, flyer, and requirements for the City of Camden Emergency Solution Grant (ESG). Click here to see the article in the Courier Post and another in the Anointed News Journal. The ESG grant is first-come, first-served. Contact our office at 856-964-6887. January 2015: Camden County OEO is thrilled to announce that our Financial Empowerment Network Program (an IDA Program) has been approved for $100,000 by Camden County. Funded by the NJ Department of Children and Families, the new matched savings program begins this month and ends in December 2015. Camden County OEO will target Camden County individuals/families at or below 200% of the federal poverty guidelines for financial literacy classes, case management and a 100% match of savings accumulated by the participants. The total savings amounts will be used to acquire a home, start a business, or attend post-secondary classes. Click here for the income eligibility guidelines. For more info or to enroll, contact us at 856-962-6911 x27. November 2014: Camden County OEO is pleased to announce that the agency has been awarded a generous grant from the Baseball Tomorrow Fund on behalf of our South Jersey Pride Baseball Club. This grant will be used to support the youth enrolled in this mentorship program to receive much needed baseball equipment and uniforms. ﻿Click here﻿ to see the press release about the grant. On November 4, 2014, the Philadelphia Inquirer wrote an article about the grant as well as the Courier Post (﻿click here﻿). Also, the Anointed News Journal posted an a﻿rticle﻿ regarding the grant. October 2014: The Youth Achievement Program provides adolescents with an opportunity to create and reach their professional aspirations by improving their interpersonal and intrapersonal skills in addition to their academic success. If you or someone you know is interested in this valuable program, call us at (856)-365-8989 or click here for more information. October 2014: October 1, 2014 marks the start of the ﻿Low Income Home Energy Assistance Program (LIHEAP) application season, which will continue until April 30, 2015. LIHEAP is a federal energy assistance program designed to help low-income families and individuals with their home heating costs. Please note that the LIHEAP application is also the application for the Universal Service Fund (USF), a New Jersey program that makes natural gas and electric bills more affordable for low-income households. For those who need additional information about the LIHEAP and USF programs, go to our Pennsauken office at 5287 Route 70, call (856) 910-1180 or ﻿click﻿ ﻿h﻿ere﻿. September 2014: Camden County OEO has been approved for Social Services for the Homeless (SSH)/Temporary Assistance for Needy Families (TANF) grant funds. If you (or someone you know in Camden County) need assistance for back rent/mortgage or utilities, come to the office at 538 Broadway or 900 Broadway in Camden to complete an application. (﻿﻿Click here﻿﻿ to see the required information for these grant funds). July 2014: Camden County OEO is administering grant funds for the City of Camden Emergency Solutions Grant to provide financial assistance for rental payments (back rent, security deposit, and monthly rent), motel/hotel payments, utility payments (security deposit and monthly utility), and relocation payments. Call our Camden office located at 538 Broadway at 856-964-6887 for more information. July 2014: Our Youth Achievement Program ﻿is dedicated to promoting academic and professional excellence within the ﻿﻿community. The goals of this program include successfully passing the GED, enrolling in an accredited post-secondary educational institution and willfully gaining employment. Since its inception in September 2012, the program has assisted ﻿39 students towards successfully attaining these goals. In the 2013-2014 calendar year alone, 10 clients have gained employment or enrolled in post-secondary education programs, 3 clients have passed the GED test, and 10 enrolled in the TABE (Tests of Adult Basic Education). Further, as the 2014-2015 year approaches, we hope to increase the number of youth we can guide on the path of education and growth. June﻿ 2014: Camden County OEO has been approved for Social Services for the Homeless (SSH)/Temporary Assistance for Needy Families (TANF) grant funds. If you (or someone you know in Camden County) need assistance for back rent/mortgage or utilities, come to the office at 538 Broadway or 900 Broadway in Camden to complete an application as soon as possible. The application must be submitted by June 30, 2014. (﻿Clic﻿k here ﻿to see the required information for these grant funds). Also, click h﻿e﻿re for a flyer about the grant funds. June 2014: Mr. Antonio English, Maintenance Staff Member, has been employed with Camden County OEO for 38 years. Also, Mr. English was recognized by Cooper University Hospital for 30 years of service as a full-time employee. Congratulations!